City council met Monday, March 5 in one of their “special” meetings. Presentation on the use of economic development and public infrastructure financing tools, including Tax Increment Reinvestment Zones and Public Improvement Districts. Many of the readers know what tax increment reinvestment zones are. 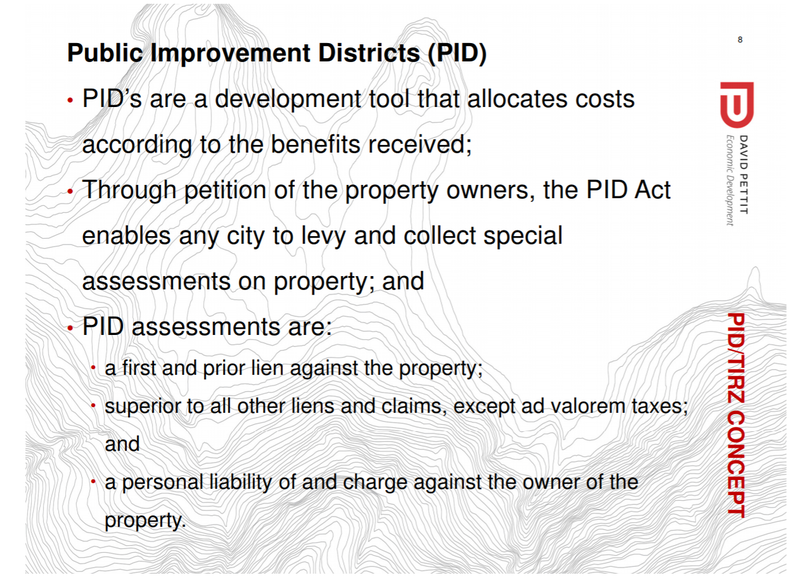 What are public improvement districts? Yep. This would allow the city to spend money in your neighborhood, assess the bill against your property, and file a lien on your property until the assessment was paid. This entry was posted on Tuesday, March 6th, 2018 at 5:00 AM and is filed under City government. You can follow any responses to this entry through the RSS 2.0 feed. You can leave a response, or trackback from your own site. These new ways of spending money by the city are a direct result of debt. More of the existing taxes collected go to debt service and so they need new ways of raising money to do things that taxpayers already pay taxes for. In this way they can fix your street and then make you pay for it twice, once through your taxes and again through a PID, because your taxes went to pay debt service in money they borrowed to do things nobody voted for. Next, people who loaded the city up with debt will be on the next higher level to saddle El Pasoans with even more debt. John Cook, for example, want to take over Veronica Escobar’s place with the County while she takes Beto O’Rourke’s place with the state. It deserves noting that Robert O’Rourke is not the son of Latino parents, he “adopted” the name Beto to hide the fact that he isn’t Hispanic but wanted Hispanic voters to think he was of Latino descent. He is a fourth generation Irish American. That is blatantly deceptive. Last time I checked, Beto O’Rourke’s “place” as is in Washington, not with “the state.” It’s silly and petty for you to suggest that a person with the last name of O’Rourke could “hide” the fact that he is not Hispanic. Do you consider it “deceptive” if Pablo in Ohio calls himself Paul to better fit in in a predominantly anglo community? Do you have a similar problem if Francisco in El Paso goes by Frank? There are several other local Anglos who use Spanish nicknames. No one seems to have a problem with them doing it. Are you equally incensed by the fact that Rafael Cruz goes by Ted? If it says “through petition of the property owners” doesn’t that mean the owners have to file some kind of petition possibly to get something done on their own property? Then the city does it and uses the lien to collect for the expenses? Am I understanding this correctly? The real question is how many property owners have to sign the petition? And, is this to fund their next unneeded friends and family deal, or has some bright useful idiot figured out how to make aging neighborhoods pay twice for street repairs. So now the whole city is a homeowners association?